"Engine Management Light is now a major fail. It must come on with the ignition and then turn off when the engine is started." So after advice on what to do its a 2006 93 z19dth 16v 150 with a hirsh map to 175. I have already cleaned the EGR valve, is the sensor reading the movment of the actuator arm (in which case can I disconnect it(how)). 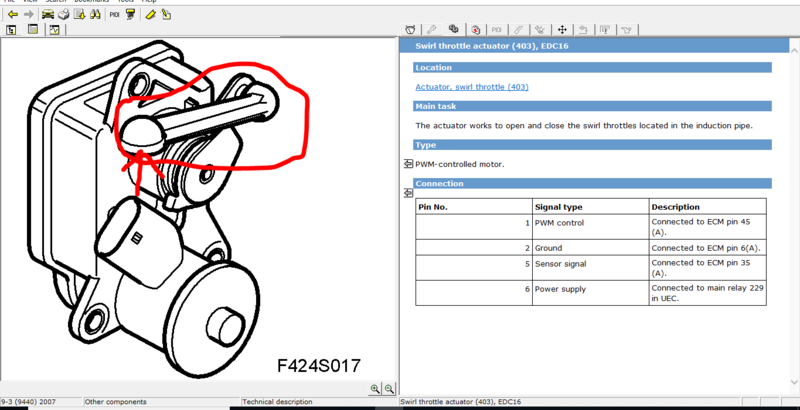 Or do I need to replace the actuator arm, the bar itself seems to be stuck in the open position probably why its never affected the running of it. The actuator motor lives on the underside of the manifold with a dumbell shaped rod connecting to the swirl flap mechanism. If the flaps are simply jammed or fixed as a result of the remap then the feedback position at the actuator may be incorrect. and the car is then non the wiser....the fault should clear unless the actuator solenoid itself has failed or there is another electrical reason. Unfortunately its not easy to get to the actuator due to its location the oil catch can and bracketry are in the way at the back of the engine block. Surgery from the top isnt easy. Alternatively you may be able to fish in a coat hanger lying under the car and lift one end of the dumbell rod away from either the actuator or the swirl rod end. This is what the connector looks like and probably 3ins long with simple ball and socket connection at each end offset. Last edited by cjapeterborough; 04-02-2019 at 11:24 AM. Engine Management Light - Please help!!! !